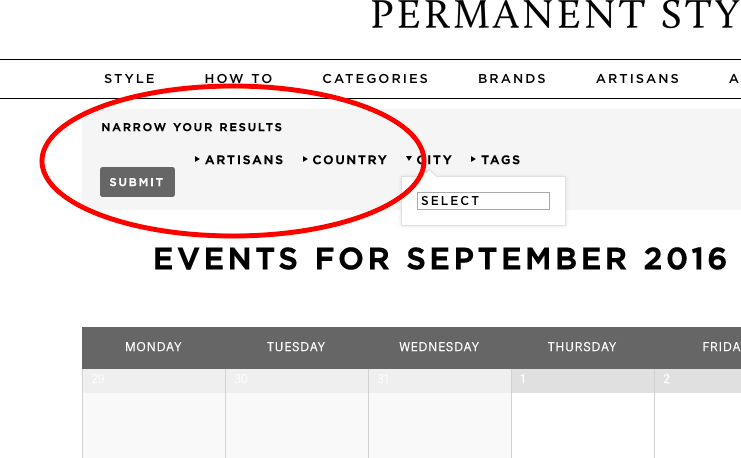 Today we launch something rather different on Permanent Style: a live Trunk Show Calendar. 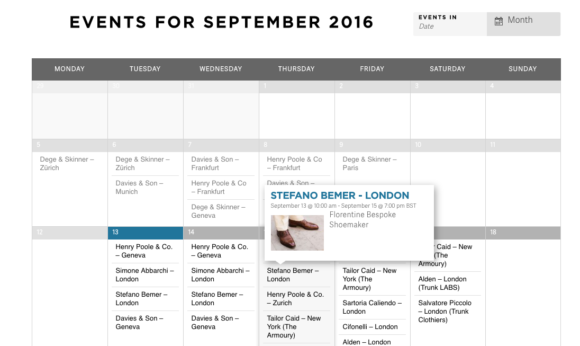 The calendar is a central, coordinated listing of bespoke menswear trunk shows around the world. It lists, month by month, who is visiting which city, when, and offering what. It has times; map locations; prices; and contact details to go straight to the makers. For those makers where I have personal experience of them, it also links to Permanent Style coverage. 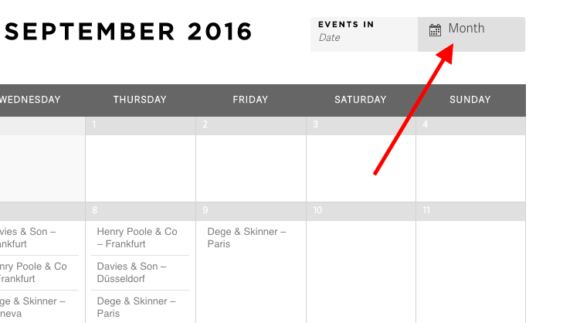 You can access the calendar here, or select it from the navigation bar at the top of the site. Several readers have asked me about creating something like this in recent months. As more men become interested in bespoke, and the number of travelling craftsmen increases, it gets harder to keep track. In September, for example, London has a new joint visit from Stefano Bemer and Simone Abbarchi, a first visit from Norman Vilalta and a rare show from D’Avino, as well as all the regulars. And then it gets really crazy in October. New York and Hong Kong are no less busy - and there are events as far flung as Baltimore, Tokyo and Vinkeveen. I had run a similar calendar in my Outlook for a while, simply so I could remember which days the tailors I use were in London. It seemed to make sense to expand that into something for everyone, in every city. One reader, Jeff, commented today: "Today I noticed a new tab 'Trunk Shows' that I had not seen before. You've just made my life easier. Prior to this I was hunting and pecking and keeping the dates of trunk shows coming to Chicago on my homemade excel spreadsheet. I'm new to bespoke clothing and find your website a most useful guide and your writing style has a nice delicate touch that I enjoy." The calendar is set up to view one month at a time, with trunk shows listed on each day. You can hover over each one to see a quick view of the details, and then click through for more. The filters at the top of the page allow you to select your city, your country, or a type of maker. We have quite a lot of cities to filter through, and there may be guys that just want to look at tailors, for example. If you want to look at future months, simply click on the next month at the bottom right of the calendar. You can also switch to a ‘photo’ view, enabling you to see all the events in a list, by selecting ‘Photo’ rather than ‘Month’ in the top right. The calendar will be updated regularly - certainly as often as the artisans themselves announce their dates. We will also be manually chasing them, so hopefully we can spur some prompter announcements as well. There are a lot of tailors, shoemakers, shirtmakers and others in the calendar, but certainly not everyone. If you or a maker you know would like to be included, please email us. There is no cost to being featured. 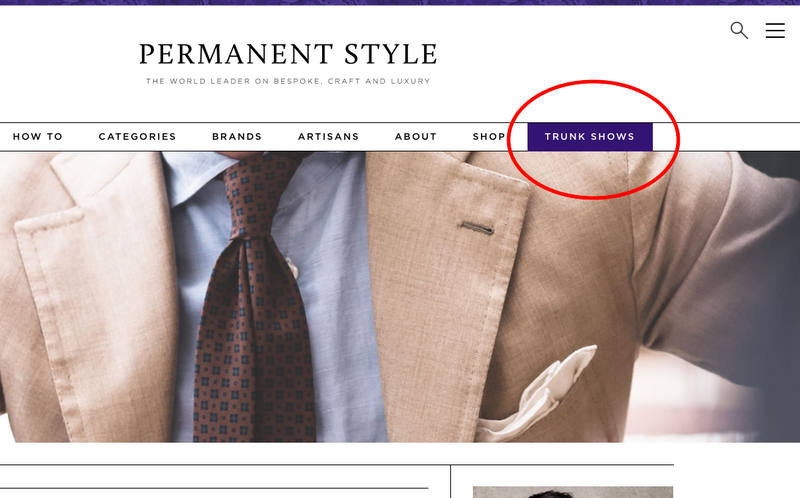 It is simply an editorial resource aimed at Permanent Style readers. And as ever, we welcome any feedback on how this could be made even more useful. You can follow the discussion on Introducing: The trunk show calendar by entering your email address in the box below. You will then receive an email every time a new comment is added. These will also contain a link to a page where you can stop the alerts, and remove all of your related data from the site. Super useful! I’ve usually had to email folks to find out when their next trunk show was. Are you the one tracking these events? It sounds more sustainable if you can convince all the artisans that they should keep the calendar up to date through you. Like Jeff, I’m also from Chicago. This is such a useful tool, Simon, especially for readers from “secondary” global markets! Great resource. Harvie & Hudson are doing USA trunk shows from 29 September to 8 October and Budd are doing USA trunk shows from 14 October to 22 October. A&S is in the USA from 17-28 October. WOW, what a great feature! I happened to miss Davies and Sons in Munich last week because I had no idea that they were coming. Unfortunately the calender seems to be incomplete. For Example Edward Sexton was in Berlin last weekend and this is not mentioned in the calendar. Good on you! Just curious, do you have any part time or full time employees who run the blog? And what is the monthly visitors by country for say the top 10? A friend is running this trunk show aspect, but otherwise it’s mostly just me. Great idea – many thanks! (On a side note: As a young professional and dad myself, I’m very impressed with your ability to juggle a full-time job, the blogging/freelancing and, from what I understand, small children. Don’t mean to be nosy, but I would be interested to hear more about your schedule and how much time you put into the blog. And could you see yourself giving up the day job to concentrate on PS, etc? Yeah, that’s not easy… Though my wife didn’t work when they were small, so that was OK, and now she’s part time. To be honest, I like having both the PS side and the full-time job. For many reasons, but one of them is that I never have to think of PS as a business, or something that supports my children. Decisions never have to be taken on the basis of revenue, which is not only nice for its integrity but may even be a competitive advantage. Another is that there are many things I don’t like about the fashion industry (shallow, conservative, volatile) and it’s nice also being in a more dynamic, professional environment. What a fantastic addition to an already great website. Speaking for myself…this is just what was needed. And we can filter the city too! This new initiative is truly a big leap forward! I must confess that this one has been beyond my own expectations! Obviously, this is the kind of initiative the entire industry really deserves! I’m very delighted to witness this happening before my own eyes! By doing this, you are opening a new promising era loaded with high stakes! And I hope that every one – beyond PS readers – will understand that. Outstanding. Thank you so much for this. Hello Simon, it is a great idea to have a listing like that. And even the search function is fantastic so everybody can check when a tailor is visiting the the own city or country. I was not aware that some of the tailors are coming over to Germany. Thank you for all your hard work. What a fantastic resource for readers AND artisans. I just booked an appointment with Simone Abbarchi for next month – I did not realize he was coming. I might suggest you add two Neoplitan tailors – Sartoria Formosa visits NYC and Washington DC via No Man Walks Alone and Napoli Su Misura visits London, New York and a few other spots regularly. Thanks, we’re in touch with both but don’t have details yet. We need details on times, location, contact details, prices etc. Could you forward me them by email or ask them to get in touch? Maybe its just on my end but I can’t seem to filter the calendar or switch to future dates. The site just freezes when attempting to do so. It’s working fine here – do try refreshing your cache as well as the page, or using a different browser. Love this! Great Work Simon!